A. The 2019 Indoor Track State Championships will be held at the Prince Georges Sports and Learning Complex (8001 Sheriff Road, Landover, MD 20785) on Saturday, February 2, 2019. The meet will begin at 12 noon. Teams will be admitted to the facility at 10:30 AM. Please do not arrive earlier. A. Entry fees for the 2019 DIAA Indoor Track State Championships are $50.00 per boys team and $50.00 per girls team. Checks must be made payable to DIAA and mailed to DIAA. Cash payments will not be accepted. B. All entries must be completed online at MileSplit.com (de.milesplit.com/ ). Entry deadline is Monday, January 28 at 7:00 PM. C.	Events and performances should be listed exactly as recorded at the meet with the seeding committee making the conversions. 1. Auto times are listed to the hundredth. Hand times are only listed to the next higher tenth and are never listed in hundredths. Hand times listed to the hundredth will not be accepted and may be considered a Sportsmanship issue. 2. Any performances considered as qualifying performances must be listed on the official results for the meet. 3. Times from the 3000m and the mile will be accepted as qualifying times for the 3200m and 1600m respectively provided unconverted times are reported according to meet guidelines. D.	Relay teams should be entered listing all relay personnel and possible alternates. Coaches should enter up to eight athletes per relay. The actual participants will be listed on the card handed in at the time of the event. If an athlete is not on the teams roster submitted online, the relay team will be disqualified. 1. There will be no additional entries on meet day. An athlete must be on the teams submitted roster to participate in a relay. E.	If athletes are submitted to the State Meet in multiple events without the knowledge of whether they would be accepted in any of those events AND with the possibility that they could be accepted in all of the events, the coach must submit an email to Jim Fischer (fischline70@gmail.com) and John Amery (jamerusp@aol.com) stating which events they would accept in the event that they are accepted in some or all the events. e.g. An athlete is entered in the 800m, 1600m, and 3200m, hoping to get into one of the events. If the athlete is accepted in two or all three of the events and doesn't wish to be in all three, the coach needs to send the email stating what their wishes are for that athlete. A.	Friday, December 1: Email addresses and cell numbers for the Head Girls Coach, Head Boys Coach, and Athletic Director from each school due to Jim Fischer (fischline70@gmail.com) and John Amery (jamerusp@aol.com). 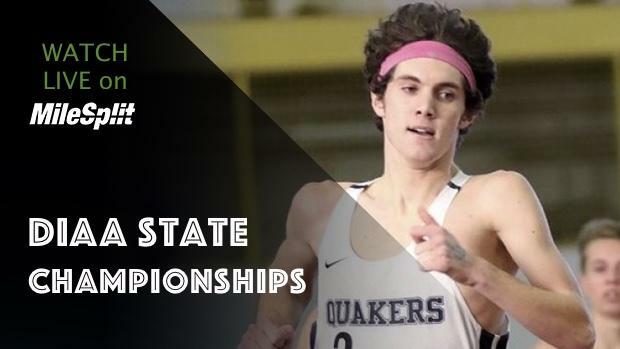 B.	Monday, January 28 at 7:00 PM: Entries due at MileSplit.com (de.milesplit.com/ ) including an email to Jim Fischer (fischline70@gmail.com) and John Amery (jamerusp@aol.com) about event cancellation if athlete is accepted in multiple events. D.	Tuesday, January 29 at Noon: Corrections to entry list due. Corrections on Tuesday between 8:00 AM and Noon are subject to a $20.00 fine per correction. E.	Tuesday, January 29 at 4:00 PM: Top 12 and Top 16 Lists posted without performances. Coaches have until 6:00 PM on Tuesday, January 29 to scratch entered athletes from the meet. G.	Tuesday, January 29 at 10:00 PM: Complete list of Top 12 and Top 16 entries with performances posted and emailed to coaches. H.	Wednesday, January 30 at 8:00 AM: Heat Sheets finalized. A. All athletes meeting the automatic qualifying standard will be eligible for entry in that event. B. An athlete may be eligible for an event if he/she meets the minimum performance standard and the entry limit for that event has not been met. 1. Some events may not reach the entry level if the minimum performance standard is not met. 2. Some events may exceed the entry level due to automatic qualifying standards and ties. C.	See the chart below for automatic qualifying standards and minimum performance standards. D.	Performances in any 2018-2019 DIAA sanctioned Indoor meet may be used to meet the qualifying standards and minimum performance provided the official meet results are submitted as indicated in Items 3 & 4 above. 1. These performances must be documented and will be checked by an indoor seeding committee. E.	A contestant may be entered in a total of four events and a school may enter a maximum of three contestants per individual event and one team per relay race. All team entries in the 4 x 200 meter relay, the 4 x 400 meter relay and the 4 x 800 meter relay will be accepted.